When updating my WordPress plugin Admin Drop Down Menu with all these cute icons from famfamfam, I felt a bit overwhelmed by them. I knew there were a lot of icons, I just never realized there were so many! Digging through 1000 icons for something that would match "Permalink options" is not that fast. After spending 15 minutes looking at all these icons again and again ("now I need something that would mean Edit Stuff") I realized that this was too cumbersome not to be improved. I needed, the world needed, a tool to find and sort them! Was I going to spend 30 minutes searching for icons when I could be spending 80 minutes coding something to do it more easily? Can't beat geek logic. So here is the famfamfam icon explorer. Thanks to consistent name patterns (something_edit, something_go, tag_something) it's now a lot easier to search for icons related to something particular. 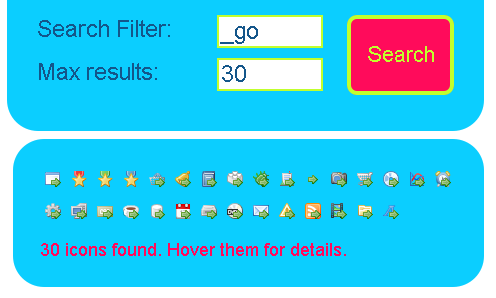 For a given search pattern you'll see all corresponding icons, and hovering them will pop a detailed view with various sizes and various background colors. That was fun to do, now I'm going to put icons everywhere! I agree with GaMerZ on the background color :) How about default of white with an option to switch the whole page color with a checkbox or link click? Related to the searched keyword easyiconfinder presents other webresults, blog and webgraphics. dutchgirl » I have rarely seen more ugly website than yours, but thanks for spamming your irrelevant link anyway. Will you include some other icons that FamFamFam Silk in you search engine? I mean the FamFamFam Flags and Mini sets (but if you know other sources of free icons for web, it would be also usefull to include them in such tool). »Next post: Admin Drop Down Menu, Now With More Safari, Fluency, MU & Columns.